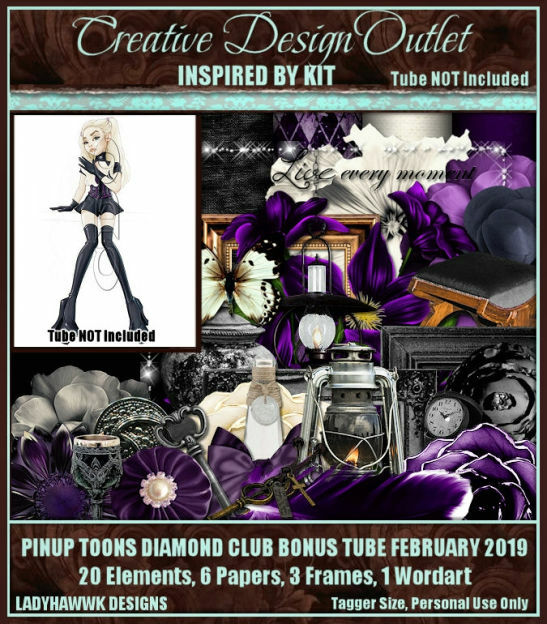 The Artist Of The Month for February is PinUp Toons and all CDO Diamond Club members will get this FREE exclusive tube this month! All members signed up by 10pm PST February 28th 2019 will get this tube + any other tube you want in the store (excludes new releases & exclusives). There is also a matching IB scrap kit from Ladyhawwk Designs that matches this tube. And as she is our Designer Of the Month you can get this kit with 25% OFF when you purchase $5 worth of her kits! There’s a category in the store for previous AOTM IB kits too! These scrap kits can be used with any other artist. Here’s what you get with a Diamond Club membership. * 20% off coupon code that can be used any time on orders over $5 except for exclusive tubes or Diamond Club memberships. * An extra 10% off when we are having a percentage off sale. * The monthly Diamond Club exclusive tube. * A free tube of your choice ($2.00 value) every month you are a member on any tube in the store except for exclusive tubes and new release tubes. * You can also join the ‘IO Groups’ Diamond Club membership group where we have lots of contests and activities. You can earn diamonds just by joining in on the fun and those diamonds can be cashed in for more free tubes!!! You do not have to join the IO group, its just an added bonus to your membership and the group has a bunch of wonderful members!! *Don’t forget all kits (apart from bundle packs) may be used with ANY artists work.